Feline Leukemia Virus (FeLV), a serious viral disease which only affects cats, can be diagnosed via a simple blood test, also referred to as a “snap” test or with an at-home lab test. This blood test is able to detect exposure to this virus. Often called the “Feleuk” test, abbreviated as FeLV, this virus test is commonly taken concurrently with an FIV (aids) test as well. How much does a feline leukemia test cost? The costs of a feline leukemia test will depend on which method you prefer as there are two popular methods: an at-home test, which uses a saliva/tear sample or via your vet, where he or she will take a simple blood test in order to gather the results. At-home tests, which use a saliva sample, are available for $30 to $45, but the results are controversial because you will still need an IFA test to confirm the results if the saliva test was positive. For example, this highly rated test on Amazon.com retails for about $40 to $50, while this Petco brand from Perfect Pet retails for about $30. Aside from the at-home test, if you were to go to a local vet, then you will need to factor in the examination fees, which, depending on your location, can cost $50 to $75, plus another $15 to $25 just for the test, bringing the grand total to about $65 to $100 for the test and results. If the test results were positive, then an IFA test will need to be performed, which can cost another $20. NeighborhoodCats.org, referencing the Journal of the American Veterinary Medical Association stated the average cost of an FIV/FeLV snap test is $15. A feline leukemia test is a simple in-house blood test that is taken inside of your vet’s office. If the results come back positive, then it could be mean the cat has FeLV or it could indicate the test could go wrong. In the case of a positive test, a vet will always perform another test, known as an IFA test, to confirm the results as snap tests, according to the Merck Veterinary Manual, have a high rate of error. If this IFA test is negative, then it could mean two things: either the cat is not affected with FeLV and/or the cat was recently infected, about a month ago, but the results are not positive just yet. If this is suspected, then your vet will want to take another IFA test four weeks later to confirm the results. After drawing the blood sample, the blood is immediately placed inside of a glass container with a substance which prevents clotting. Combining this blood with a chemical, the sample is spread over a filter paper which is impregnated with specific antibodies and antigens. If the color changes a certain color or a line develops past a set point on the paper, it will indicate a positive result, similar to what you would see with an at-home pregnancy kit for women. Most vets will take the test directly in house while some, depending on their preference, may outsource to an outside lab. The entire test takes about 15 minutes to perform and the results, if sent to an outside lab, will take up to two days to receive the results. The most common way a cat gets FeLV is via saliva or casual contact with another infected cat. This can include sharing a food bowl, touching noses and/or grooming one another. As this disease is highly contagious, cat owners are highly advised they keep their cats away from strange cats, and owners should always wash their hands thoroughly in between handling cats. While adults cats are susceptible to this disease, kittens are at the highest risk. According to FixNation.org, it’s always best to keep your cat indoors, away from feral/stray cats. Always isolate and test a new incoming cat/kitten before it’s allowed to interact with other household pets. Keep in mind, most of the time, you will not be able to tell if a cat has FeLV just by looking at it as cats with FeLV can look perfectly healthy. For this reason, even if you know the “strange” cat and it appears healthy, it’s always best to avoid exposure. If adopting from a local shelter, do keep in mind that most will not test for FeLV or FIV. Most shelters will only test if the cat is showing active signs which may indicate signs of the illness. Recent estimates, according to Cornell University, indicate about 4% of the 83 million cats have either FIV or FeLV. 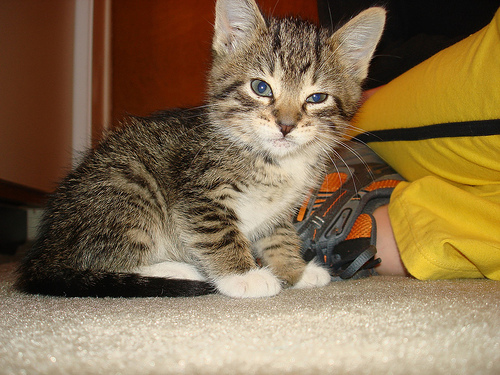 Kittens from the same litter, according to the ASPCA, may have different results for a number of reasons and one kitten test should be a representative for the entire litter. 85 percent of cats diagnosed with this disease will die within three years of diagnosis. However, if the cat obtained the virus via blood or sexual contact, the chances of them living a longer life is much greater. At this time, there is no cure for FeLV, but attempts, according to the Cat Doctor, have been made, including AZT, ImmunoRegulin, Interferon and Acemannan. There is no evidence which indicates FeLV can be transmitted to people, but it’s recommended cats with FeLV stay away from pregnant women, babies, the elderly and those with a weakened immune system.